Transitioning to a new lifestyle – it sounds so good in theory and I’m sure it will all end well, but the changeover is quite an assault on the senses. Sleep becomes a distant memory. All the noises are new and you can’t tell what’s just a creaking house settling down versus something really wrong. It’s a legacy of the fear paradigm we are trapped in on this planet – at every turn you are told you are not safe. There is no evidence to believe I am unsafe in my new home, but still; the back of your mind niggles in the dark of night when you’re lying there alone. So the fear won over and the alarm systems reactivated just for peace of mind. Perhaps tonight will result in some real sleep. It’s been 2 weeks since I had a full 8 hours and I am struggling with it. Dogs barking – all.day.long; all.night.long. There are pros and cons to living in a complex that doesn’t allow pets. The people party all day and night, but there’s no dogs barking. The cats fight all night, but nothing a glass of water can’t fix instantly. In the ‘burbs however, everybody has dogs; big dogs, little dogs, medium dogs – and those dogs are highly alert. (More on dogs in a future blog). Getting used to the barking has been challenging as well as understanding which barks means something versus them just being bored. In between silences – I lived next to a highway for 9 years where the traffic was deafening 24/7. Here there is only the occasional schmuck that must drag race up the one road (thanks so much biker…), but apart from that, it’s really pretty quiet on the traffic front. Once the dogs have settled down, and the world has gone to sleep, all you hear is the wind blowing through the trees. It’s like that right now. It’s so beautiful – but suddenly it’s too quiet, so you lie there, listening. Birds – I love birds, just wanna be surrounded by birds. But not at 3 in the morning when they have decided it’s now time to wake up. 3am?! What sort of time keeping is that? I thought they are supposed to chirp just before dawn. They did at my old house, not so here. My property is surrounded by trees and the birds nest in droves, the chirping is LOUD. It took a week, but am now sleeping past the 3am bird wake up call at least. I’ve been a night owl for a decade – working late into the night when it’s quiet so I can get things done. It was nothing for me to be up till midnight or later working, then sleeping till 8am the next day. No such luck in the ‘burbs. The domestic workers, gardeners and fitness freaks start arriving at 6am, which means the dogs go ballistic and there is no sleeping through that lot. I cannot function on less than 7 or 8 hours sleep, so now I have to reset my body clock to go to sleep at 9:30pm the very latest to be up by 6am. By 2pm in the afternoon I am so exhausted I can barely function. My body does not know what’s hit it. It’s tired and confused and not impressed with the new arrangements. Trading traffic pollution for light pollution – no highway noise here, but there are 3 glaring, bright orange street lights that flood this entire garden and house. I barely even need to put on lights inside it’s so light. Kinda messes with the ability to see the moon and stars, although this is the city so that’s not easy anyway. The first part of garden planning is to put up dense, fast growing trees to block that out so I can make the magical garden I have planned. Being able to be outside a lot – I had honestly forgotten what this was like. My previous place was so noisy that I didn’t want to go outside plus there was nowhere really to go. But being able to move any time you like and give your body a break from the computer is really an incredible gift. I get to look into trees from every corner of the house and there are lots of doors that I leave open so I can wander in one side and out the other, I love it. That patio is just my most favourite place and I can sit there and just ponder the wonders of life on it. I can now go for walks every morning and not be asphyxiated by carbon monoxide from the traffic, and I do. But you know what my other favourite thing to do right now is? Sweep! 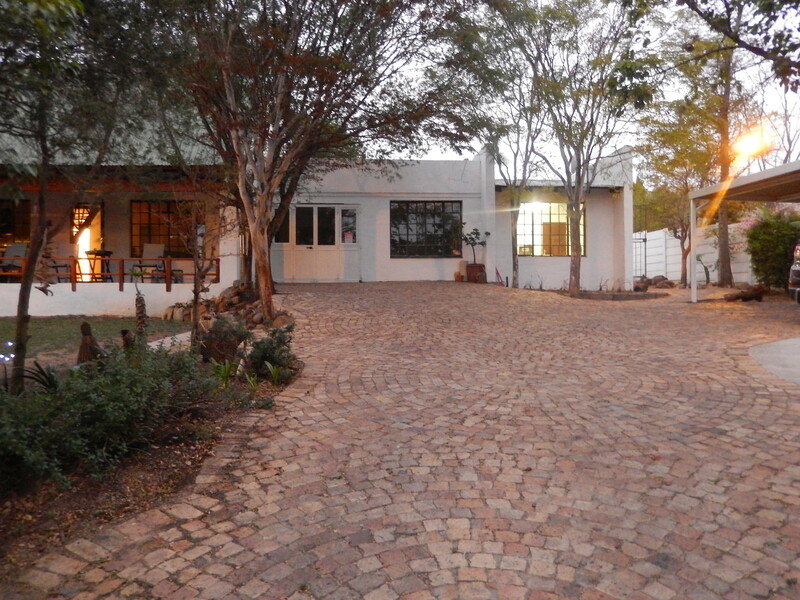 It took me 3 days to sweep the driveway to rid it of the seeds from the leopard trees. I sweep the patio every day. I sweep the leaves that wander inside. When I am stuck on a problem, I stop, pick up the broom and sweep. Don’t under-estimate the power of the simple things in life. Being a middle class citizen means I’ve had most things in my home, car and garden done for me by workers; but doing something arbitrary like sweeping has given me a real sense of connection to my new home. Go figure. I’m sure this will all be a distant memory in a year from now, but right now though I am going through a complete lifestyle change. The sedentary sloth trapped in a small space has been let out to breathe and move and it’s not that easy. But I’m out of excuses now so I have to step up to the plate I served myself. My whole body is sore but it’s a pain of love and gratitude for the incredible space I have landed in. Previous The Right Fork Lives!